Published: Dec. 20, 2015 at 06:43 p.m. Published: Oct. 18, 2015 at 04:50 p.m. 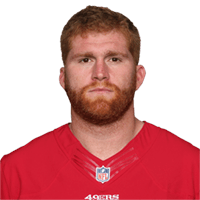 Published: Dec. 7, 2014 at 05:00 p.m.
San Francisco 49ers quarterback Colin Kaepernick throws an 8-yard touchdown pass to full back Bruce Miller. Published: Oct. 28, 2013 at 02:08 a.m.
(14:24) C.Kaepernick pass short right to B.Miller pushed ob at JAX 30 for 43 yards (J.Evans).